Sen. John McCain died of glioblastoma, an aggressive brain cancer. 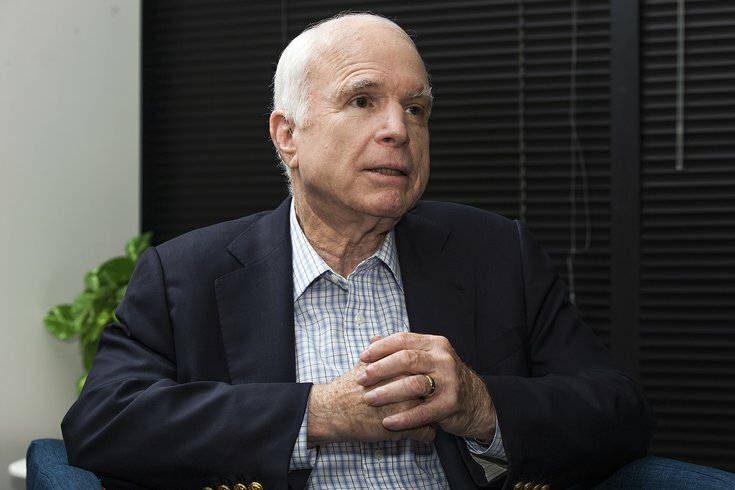 New research offers hope that better treatment options may become available to people suffering from glioblastoma — the aggressive brain cancer that claimed Sen. John McCain's life. Nearly 24,000 people are expected to be diagnosed this year with glioblastoma, according to the American Cancer Society. And with a median survival of 14 months, their prognoses are hardly optimistic. The cancer, which also killed former Phillies All-Star Darren Daulton last year, is commonly treated with a drug that cuts off the malignant tumor's access to blood vessels. In theory, that should eliminate the supply of oxygen and nutrients the cancer needs to survive. Still, those treatments have not shown an overall survival benefit in many malignant cancers. And researchers at the University of Pennsylvania may have determined the reason. Glioblastoma cancers transform endothelial cells – which line the interior of blood vessels – to resist treatment. But researchers also discovered a way to counteract that resistance. By blocking the pathway that regulates cell growth and division, researchers found a way to prevent the tumor's endothelial cells from transforming. That leaves the tumor susceptible to the original treatment. There are already drugs available that block both blood vessel access and the pathway to cell growth and division. The researchers, led by Dr. Yi Fan, found such drugs improved the overall survival in mice. The study was published Monday in the journal "Nature Communications." It was supported by the National Institutes of Health, the American Association for Cancer Research, the B*Cured Foundation and the McCabe Fund.